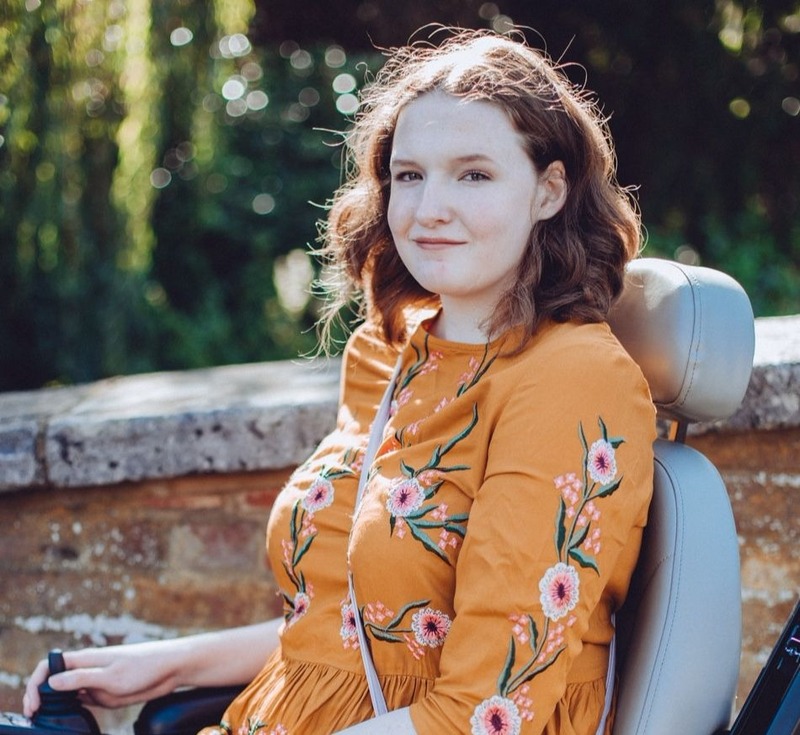 It's nearly been 5 weeks since my corrective spinal surgery (spinal fusion) so firstly apologies for only getting round to writing this post now. I cannot believe it has been over a month, it almost feels surreal to think that I've actually had it after waiting for so long. I wasn't sure if I was going to write these sort of posts but when I was waiting for my operation reading posts like this and watching similar videos of others stories helped me a lot so hopefully I can help someone else. These posts are of course more for the benefit of scoliosis sufferers but I know a lot of you are interested in this. Whilst I was in hospital my Mum kept a kind of diary about what I did each day which is so handy as I can't really remember much from when I was in hospital! Like I said I hope these posts can help someone as when I was waiting for my operation I just wanted to know all about other peoples experiences! A little note, I will be completely honest in these posts, no point sugar coating anything! On the day of the operation as I was woken up early at about 6:30am after a bad nights sleep to have my last sip of water. I was also told to shower and change into some very attractive paper pants and a gown, I'm sure that would have made a good OOTD! We had initially thought that I was first on the list but it turned out that I actually wasn't due to go down to theatre until about 1pm. Time dragged past slowly but finally at 1pm they came and gave me my pre-med to try and calm my nerves, I don't think it really helped! If you are nervous do ask for one though as it might work for you. I was taken down to theatre at 1:30pm and tearfully said goodbye to my parents, it is a bit daunting in the anaesthetics room, everything suddenly becomes real. 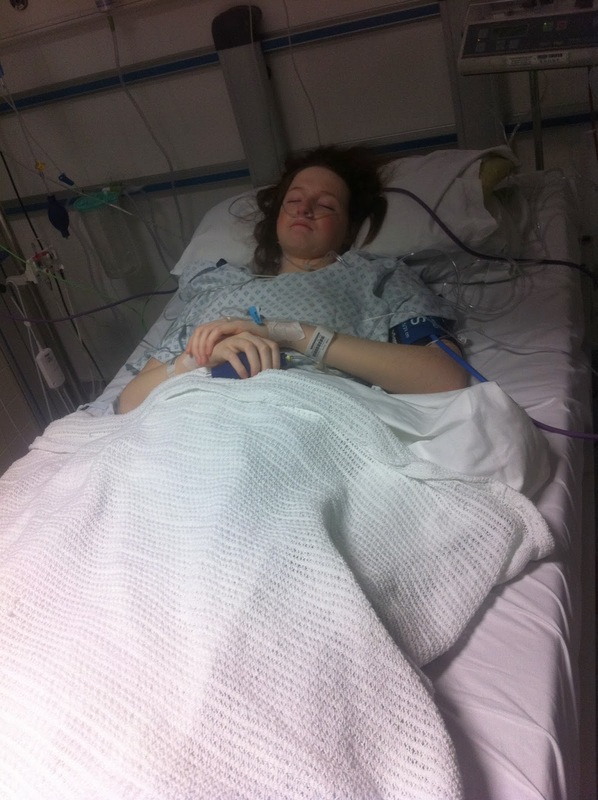 The doctors were really nice though and put me at ease, before I knew it I was out like a light! 5 and a half hours later at 7pm my parents were told that I was in recovery and that the operation had gone really well. Apparently when I woke up I was quite distressed and I was in a lot of pain, I don't remember this at all though nor do I remember the days after. 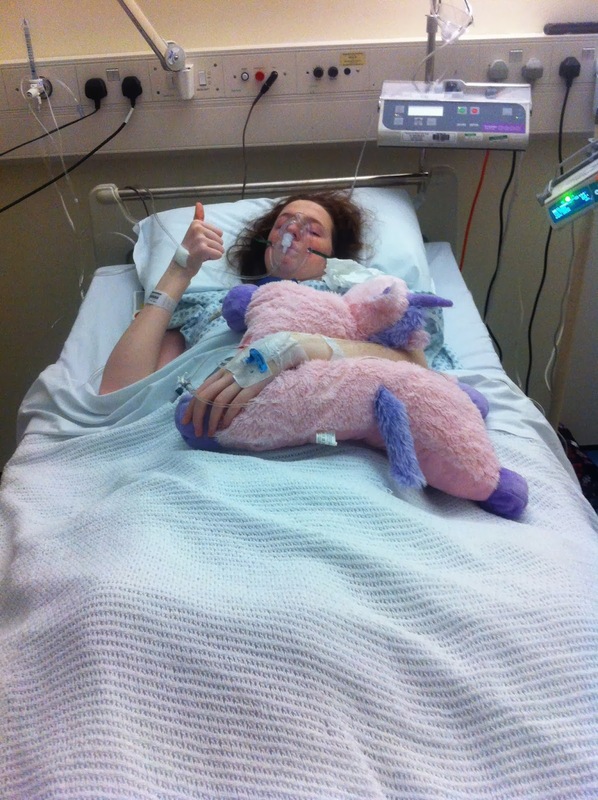 They showed me how to work my morphine machine and soon I was feeling more comfortable. My anaesthetist was really nice and stayed with me for a few hours after my operation as I was quite distressed, apparently all I kept doing was thanking her! I was transferred to HDU at 7:45pm, apparently I had a rough night and was in a lot of pain but again I don't remember. I do remember having some hallucinations caused by the morphine though, at times I thought I could hear my cat Bruiser purring, I kept asking if I was wearing a skirt and I was convinced that we were on our way to America?! After a rough night I woke up and had a small amount of coco pops and then saw my Physio, Darren. He and a few nurses helped me sit up for the first time, they really don't waste any time when it comes to getting you moving! It did hurt but you have to keep telling yourself that the quicker you do these things the quicker you will be out of hospital. I also starting reacting to the morphine though and I was itchy all over which is quite common, they manage to control it with some Piriton though which I was so happy about! I was transferred back to the teenagers ward at lunchtime and thankfully was left alone for the rest of the day to sleep. Excuse the very swollen face, it is common after having surgery where you are lying on your front! I was still in pain on day 3 but I also struggled to get comfortable for most of the day so you can imagine how unenthusiastic I was when the Physio came back and said that he wanted me to stand and then sit in a chair! This is one part I do remember, I was very nervous but determined. I had the help of two people and I was quite wobbly when I stood due to my blood pressure being low but slowly I managed to shuffle myself towards the chair. It all seemed to be too much for me though because I was sick on the Physio's shoes, apparently he was new as well, oops! I was still determined though and managed to sit in the chair for a minute. I was then moved out of my little side room and put on the main ward as someone else needed my room, it was nice to have company on the main ward. Throughout the night my pain wasn't as bad and when I woke up in the morning it was still bearable, apparently I said it was at a 4. I did have a few other problems though including sickness, I couldn't keep anything down and the anti sickness drugs weren't even working. I also had a few other problems but I'll spare you the details of those, not sure you want to know everything! Apparently I was white like a sheet for most of the day but did start to look a bit brighter in the evening, I still couldn't eat though. They changed my painkillers on Day 5 and gave me lower doses which I coped with, I was happy that the pain was getting more bearable. I also managed to eat a bit of fruit including some banana, a fruit that I usually hate! I sat up on the side of the bed with just the help of my Mum and I was also by this time managing to roll in bed by myself, just about. In the evening I had a few chips but was nervous about eating because of the sickness. That night I did struggle to get comfortable, probably because of the painkiller change, I always found the nights in hospital a lot more difficult anyway. I woke up on day 6 and had a bit of fruit and jelly after eating went well the day before but unfortunately I couldn't hold it down, we had no idea what was causing my sickness to continue. I still wanted to get out of bed and have a little walk around though, I managed to walk to the toilets and back and then I sat in my chair for a little while before needing to get back into bed. I still felt sick at lunchtime so they gave me a very strong anti-sickness drug through one of my lines and it really hurt when they administered it, like a burning sensation. I slept for a little while and when I woke up I managed to eat a whole apple and I turned myself completely on my own without discomfort for the first time. This is unfortunately where the problems started. During the night I woke up with a excruciating pain in my right knee, it was the worse pain I've ever experienced and nothing helped it, not even strong painkillers (they did refuse to give me morphine though!). I was crying because of the pain and only slept for about 2 hours that night. In the morning the pain had settled a little but it was still there. A good thing is that they did take out my catheter though. One thing I was worried about was whether it would hurt when they took it out, it honestly doesn't hurt, it just feels a little uncomfortable and it is over before you can blink! This meant I could use a toilet but I couldn't walk because of my knee so I had to be wheeled there and back very quickly so I could lie down as soon as possible. It seemed that lying down was the only thing that made the pain better. I saw the Physio and one of the doctors and they told me to do some leg exercises and put ice on it. Soon enough it felt a bit better meaning I could walk to the toilet. When I was there I looked in the mirror at my new figure and cried happy tears, I couldn't believe how different I looked! I also started to eat and drink more and I managed to sit down for about 10 minutes. That day I also had my dressing changed to a waterproof one so I could eventually have a shower. I woke up feeling a lot better and managed to have my first shower, which was really nice, having a shower is definitely something to look forward to after your operation! Afterwards I went off to go and have my X-Rays done which I was very excited about. Whilst waiting for the doctor I saw the occupational therapist who gave me my bath board, so I could have showers sitting down, and also a raised toilet seat. I also went up and down some stairs with the Physio which meant they both said I was ready to go home! 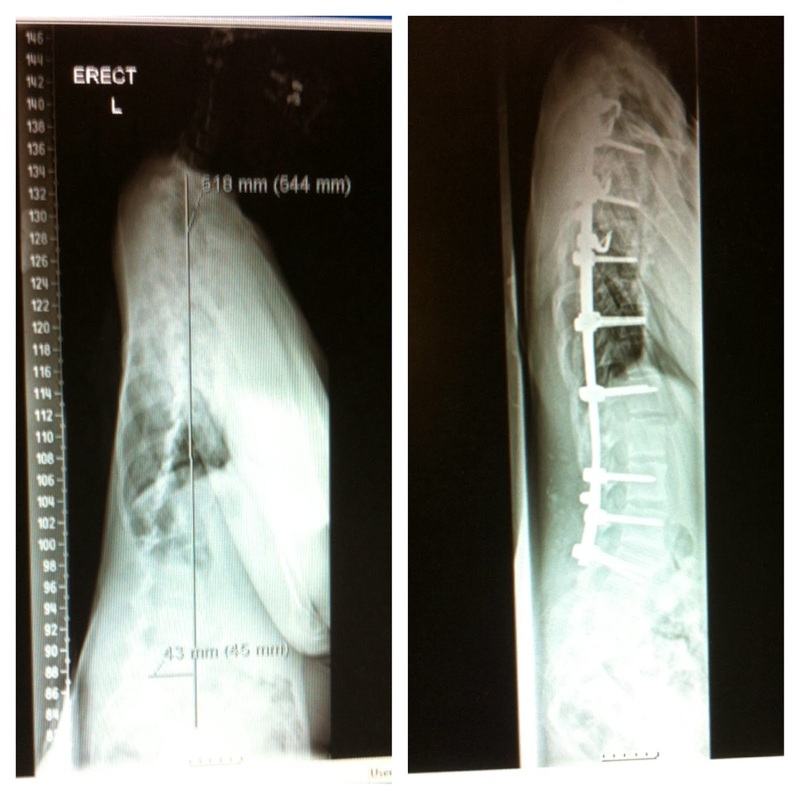 When I saw my X-Rays I was completely amazed, I didn't think my surgeon would be able to correct it so much! They think that my curve was at about 50 degrees just before the operation, I don't know unfortunately what it is now though. 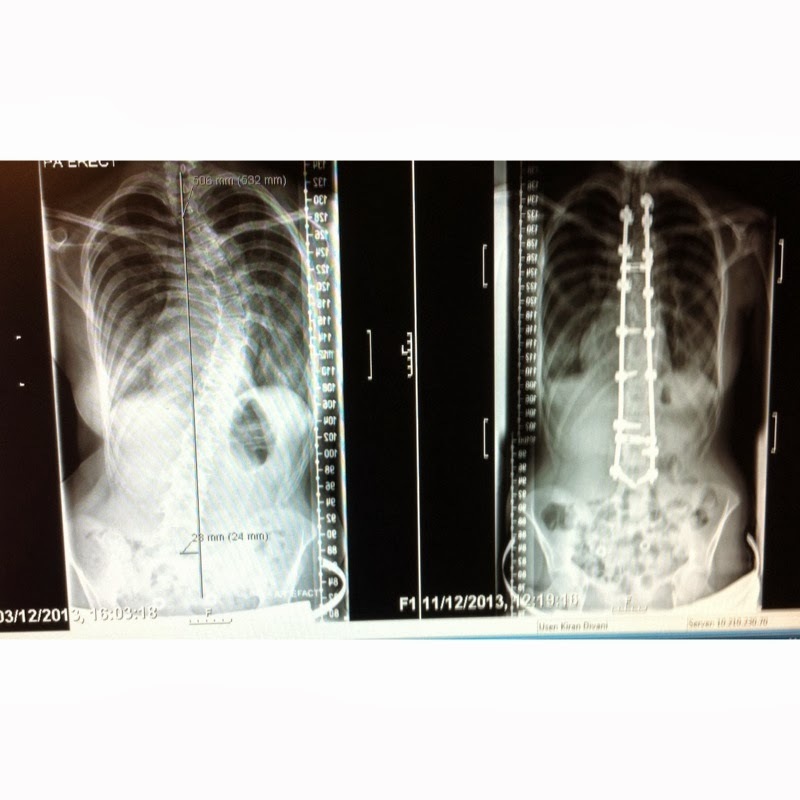 My surgeon decided to fuse nearly all of my spine as he thought that any spine left unfused would become curved because of my Marfan's Syndrome, it was better to do it all in one op rather than come back years later for another. This does mean that I've lost a lot of flexibility and I have got a longer scar than most but it really doesn't bother me. Afterwards I went home! The car journey was uncomfortable but it wasn't as bad as people had said. I'd say to use as many pillows as you want, I had two behind my back and held one in front of me as others had said that doing so had helped them especially if they hit any bumps in the road. I'm not sure if it helped but it certainly made me feel more supported. I'll talk more about everything in my next post as this post is already very long but just a quick thank you to everyone for your continued support, it has just been amazing! Wow this is such a great post, you're so brave :) your spine is incredibly straight now! I'm glad the pain wasn't too unbearable, hope you're feeling much better soon! Wow Shona. Respect!! :-) I wish you a speedy and easy recovery. Just been reading all your posts regarding your surgery. It's incredible how much you have gone through yet so positive. I giggled at the part where you thought you were wearing a skirt haha. Bet it was quite surreal being told what you had said! I wish you the speediest recovery and look forward to reading your future posts.